When a Porsche enthusiast needs to have some emergency repair work done, they want to know their high-performance car is entrusted to the care of experts. You want to get your car back on the road quickly, but you also want to know your Porsche repairs were handled right… the first time. That's why you should trust all your Porsche repair work to Orr Automotive. We've been handling the service and maintenance of foreign cars since we opened our doors in 1980. We've got the knowledge and state-of-the-art equipment to make certain your Porsche repairs are handled expeditiously and with the highest level of customer service and satisfaction. When you arrive at our shop, you will first receive a friendly and courteous greeting. 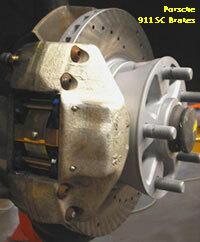 We will talk to you about your Porsche service and repair concerns and let you know how we will proceed with the work. Once your car is in the shop, we conduct a 27-point inspection to identify any safety issues or service concerns. We then take on the job of keeping your vehicle performing the way the manufacturer intended. Whether it's a simple oil change or a more complicated repair, special cars like the Porsche deserve more attention to detail than your ordinary car. The service and parts teams at Orr Automotive are fully prepared for this task. Trust your Porsche to the experts at Orr Automotive. Schedule your Porsche repair work today. We know how much you enjoy driving your Porsche and we also know you want to keep it running in top-top condition. To enjoy the Porsche experience to the fullest degree, it's important to keep your car maintained. Proper maintenance is also imperative to holding its value. Maintenance should be done on a regular basis, and more times than not, should be performed at a greater frequency than recommended by the manufacturer. There are benefits in bringing your Porsche to Orr Automotive for its periodic maintenance. We have the opportunity to get to know you… what's important to you and how your Porsche is running. We can tell by the wear and tear on your vehicle the problems you may be encountering and we can identify the areas needing Porsche maintenance. We are able to provide you with the personalized Porsche service not typically found at dealerships. See the difference a local car repair shop can make for your Porsche maintenance needs. Call for an appointment today. 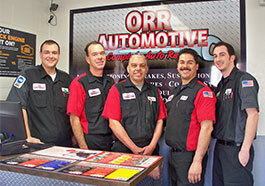 At Orr Automotive, our Porsche service team cares about your desire to keep your car running at peak performance. We take Porsche maintenance and service issues seriously and we give you the best advice on how to maximize your car's safety and handling. For all your Porsche service or repair needs, call Orr Automotive!